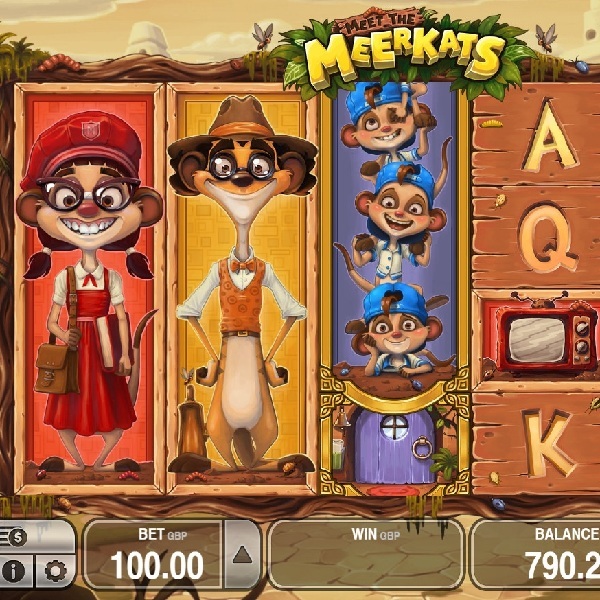 Many believe that Meerkats are some of the cutest creatures around and the new Meet The Meerkats slot from Push Gaming certainly backs this up. It is a 5 reel, 40 fixed payline slot. The reels are set against a backdrop of a meerkat home complete with windows and a doorbell. The high value symbols include three stacked meerkats, a telephone and a television. The wild symbol is four small meerkats on top of each other and it also lands stacked. The scatter is the door to their home. Landing three scatter awards you with five free spins but first one of the meerkat symbols and the multiplier is selected. The chosen symbol appears more often during free spins and all wins are subject to the multiplier. If the first reel is filled with the same meerkat symbol then a free re-spin is awarded with the symbols frozen in place.